Syntax tanks are being used to dump the collected dry waste. In a few parks such as Anna Nagar Tower Park, a wall like structure is made with the bamboos, which are 15-feet long, five feet in breadth and three feet deep”, said the official in charge of the park. Chennai: Greater Chennai Corporation has often been at the receiving end of citizens’ angst for not using scientifically approved solid waste management practices. Overflowing dust bins, burning of garbage in the landfills and failure in adhering to Solid Waste Management-2016 rules are some of its ‘sins’ that got the brick bats for the civic body. But the Corporation is now slowly taking steps to repair its tarnished image and one of the initiatives is the project to convert the huge collection of fallen dry leaves in the 525-odd parks that it maintains across the city into organic manure that is fed to the plants and trees in those parks themselves. This would also reduce the garbage inflow into the city’s landfills such as Kodungaiyur and Perungudi. Corporation Commissioner G Prakash conceived the idea of making the parks green by composting the dry waste and using it as manure for the trees here. “It is the concept of recycling and composting at source. No dry waste goes out of the park premises. We recycle it in a cost-friendly manner,” said a corporation official. Syntax tanks are being used to dump the collected dry waste. The waste is mixed with curd, jaggery and crop residues. In a few parks such as Anna Nagar Tower Park, a wall like structure is made with the bamboos, which are 15-feet long, five feet in breadth and three feet deep”, said the official in charge of the park. “We have trained the workers in the parks to adhere to the concept. Other wastes such as plastic are segregated from the dry leaves and taken away,” said the official. The 15-acre Anna Nagar Tower Park has more than 1000 trees, 700 of them being 25-30 years old. There are 13 cement structures set up in the park premises for composting. Walkers and other visitors appreciate the efforts. “The burden on landfill has been reduced. Most of the time, dry leaves are burnt causing pollution. 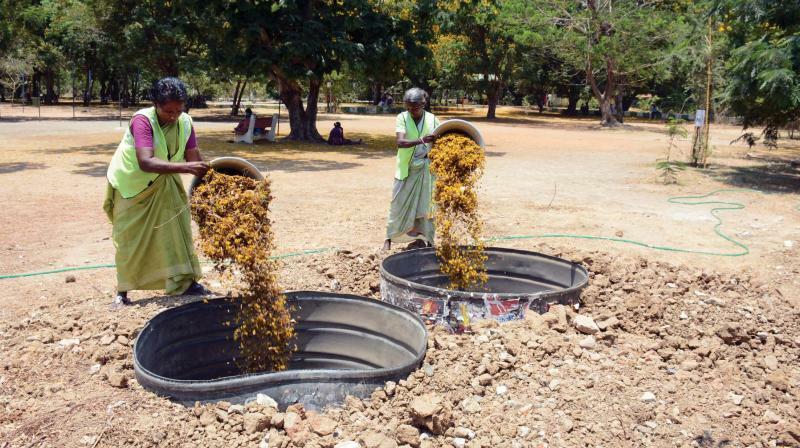 We are eagerly waiting to see the first batch of manure,” said K Gowri, a resident of Anna Nagar.